Prior to the innovations of social media, many of us thought of filters as something used only in making coffee. Now, when someone says they’re using a filter, it has a completely different meaning. Filters are a layer for our Instagram posts and stories and our snaps on Snapchat. In fact, filters have grown to be an expected aspect of our social media lives. It’s not uncommon to see an image and wonder exactly how it has been altered. Although, in Snapchat’s case, it’s usually pretty obvious where the changes lie. Snapchat first introduced filters in 2015, officially rattling every person in my college friend group. In the beginning, they were referred to as “lenses,” which may have been an early foreshadowing to the hands-free Snapchat Spectacles released in 2016. 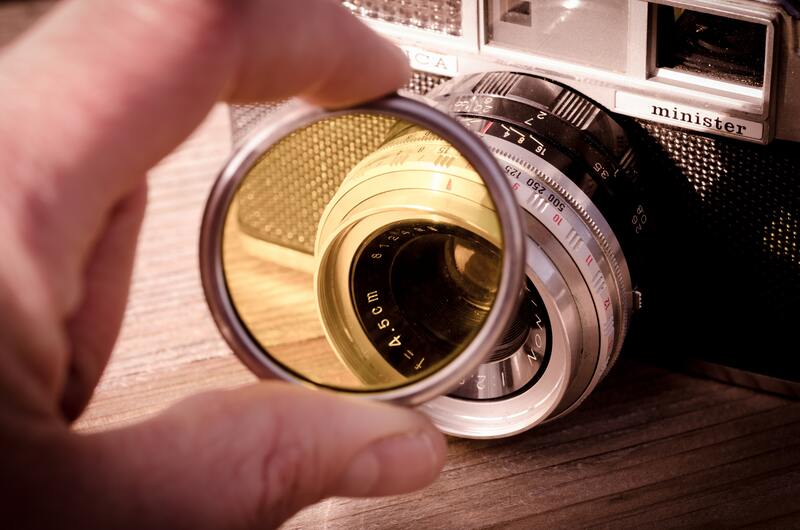 Lenses and filters vary slightly. According to Snapchat, lenses are anything that moves, while filters are the location-based geotags (which we will discuss). However, many people refer to a filter as anything that “goes over” your photo or otherwise changes its appearance. Filters come in a variety of filters. Facial filters are a form of virtual reality wherein facial recognition creates a digital animation and alters a user’s reality on-screen. Geo-location filters recognize a user’s location and offer corresponding animations. In other words, a facial filter changes a user’s appearance or voice in a photo or video. A location filter simply adds images or text to the screen, which communicates that user’s location to followers or others exploring the app. Related: Want to learn more about Snapchat? We share the secret on unlocking ALL of your Snapchat Trophies and improving your Snapchat score! And while you're at it, learn how you can use filters in Snapchat stories! How do I use Snapchat filters? You know how to use Snapchat for it's core picture-sharing feature but now it's time to go further. Geo-filters and facial filters are both accessed in different ways. In this guide, we’ll go over all different types of filters and maybe even help you become a filter fiend. Let’s start with facial filters. These can be accessed through either side of the camera, assuming there is a face to be recognized. When you open Snapchat, it will open to its default setting of the back-facing camera. If you’re looking to take a selfie, double tap the screen to switch to your front camera. You can also tap on the camera icon on the top right. The edges of this camera form two arrows, which tells you that button switches the screen around. Once you have performed either of these actions successfully, the camera will be facing in the direction of your choice. To get your facial filter options to appear, you have to position the camera onto your (or a friend’s) face. Press and hold the part of the screen where the face is with your finger. This tells Snapchat you’re attempting to make it recognize a face. The face should be fairly close to the camera and in plain sight so Snapchat is able to pick up on features and movements. Once the facial filter feature (say that five times fast) has been activated, you will see a horizontal menu appear at the bottom of the screen. These are all the options you have of facial filters. 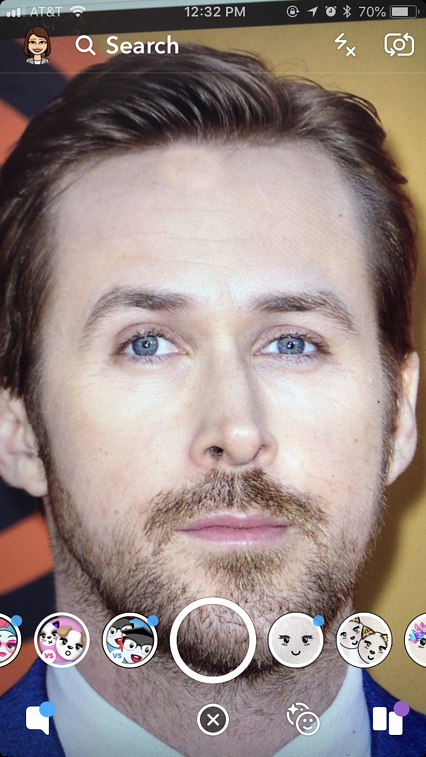 Here's a photo of my main guy, Ryan Gosling, rocking the filter menu at the bottom. I simply put the camera on his face, pressed on my phone screen, and the menu appeared. Keep in mind that the filters change fairly regularly. We live in a 24-hour news cycle wherein people, and especially youth, are conditioned to move past things quickly. A filter that is fun today is old news tomorrow, and, for that reason, they rotate. Much like snowflakes no two Snapchat filters are alike. Many are interactive, meaning the images move as you move, alter your voice as you speak, or make noise. Interactive filters are activated differently, as well. Some come alive when you stick your tongue out or open your mouth. One of the original Snapchat facial filters featured a rainbow pouring out of users’ open mouths seemingly like vomit. It may sound disgusting, but, I promise you, it was innovative. Filters range from putting sunglasses on your face to a top hat on your head, to making users appear much older, to providing animal ears, to making certain features larger or smaller. By “interactive” filter, I mean any filter that requires facial movement in order to display its full range of capabilities. This means any filter that has users open their mouths, raise their eyebrows, or speak in order to unlock the extra functionalities. While all filters move (even a flower crown filter has the crown move as your head moves), I refer to a static filter as anything that can be taken at face value. No pun intended, but I won’t apologize for it. Examples of static filters are any of the animal ear filters or a filter that puts a beard on your face. They do not offer any extra actions, so to speak. What you see initially is the entirety of that filter’s functionality. Now, for some pictures of me! Here's me rocking a filter with a bunch of cherries and these oddly back-in-style wireframe glasses. The other type of filter we discussed is Snapchat geofilters. Both geofilters and facial filters can be used at the same time. 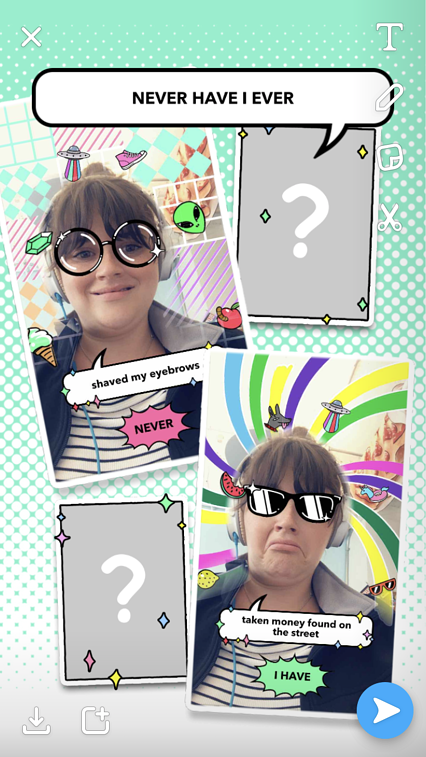 Facial filters alter the user’s appearance, while geofilters are graphic add-ons that are unique to a user’s location. Geofilters can be included in an image or video after the snap has been taken. There are a number of ways to add a geofilter. One way is to take a picture or video and swipe the screen to the left or right. Unlike facial filters, users must first take the picture or video in order for the geofilters to appear. Some filters have no direct correlation to where you live. For example, one filter of the day asks a question regarding e-scooters, wanting to know what Snapchat users think of them. This filter is probably only applied to users in certain areas, but doesn’t necessarily relate to that location specifically. Other filters show exactly where you are in the world! Take this one for example, which communicates that our office is in the west loop of Chicago. Much like facial filters, geofilters are ever-changing. Snapchat considers itself a source of news and often adjusts its filters to reflect present happenings. For example, during the Superbowl or Oscars ceremony, you might see a geofilter that celebrates the occasion, a great use-case for Snapchat for business. Enjoy this picture of Kate Hudson using a past Superbowl filter. While geofilters are based on your location, they don’t always explicitly communicate where you are. Snapchat stickers, however, such as the time, altitude, or temperature, are also based off of your geography. In order to add one of these to your snap creation, again, take the picture first. After you’ve taken the picture, a menu of icons will appear at the right side of the screen. Choose the icon that is third down from the top. It looks like the page of a book that is being turned. Click on this icon. From this screen, you should see the option to add the time, the temperature in degrees celsius or fahrenheit (depending on your settings), and, more recently, your altitude. Who knew that my office building has us nearly 600 feet in the air!? Full-screen geofilters cannot be rearranged. If a Chicago filter has The Bean in the bottom-right corner of the screen, that’s how it stays. The geofilter stickers you see above can be moved around to any part of the screen, just like text or emojis. Just how many different Snapchat filters are there? As I mentioned earlier, the filters are ever-changing as Snapchat figures out what users like and dislike. In order to full understand what this app offers, you’ll need to download it and see for yourself. More recently, Snapchat has begun increasing user interaction with filters by creating games. One example of this is the My Face When filter. This filter prompts you to make a face relaying various emotions. After the pictures have been taken, Snapchat gives the pictures comical captions. Today’s generation of internet-users is obsessed with memes and quizzes, and games like this relate to that mentality. Another game-like filter the app created is the Never Have I Ever game. Snapchat gives you a short list of tasks and you have to denote whether you have done them or not. Once you answer, it takes a picture, and you have a small collage of these quirky images to share. Neither of my attempts are super flattering, as I was still figuring out the game while playing. Other filters are more dramatic and eclectic. One filter surrounds your face with a frame of flowers. Other filters mess with your facial features, such as this one. One even turns your face into a finger, which appeals to my love of Spy Kids and the thumb-thumbs. (My colleagues didn’t appreciate this one. I can’t understand why? You may not find all of these on Snapchat today, because they’re from past and present. But if you keep signing on and checking the filters, it’s possible some will return, or a fun, new filter will become available. Who can see my Snapchat filters? As with any social media or digital media sharing platform, you want to be sure your data is safe and your content is as private as you desire. This is especially true for young people, who often require more protection from other people on the internet. Snapchat’s privacy settings are fairly black and white. You can choose that anyone is allowed to send you snaps or only your friends are allowed to send you snaps. The latter keeps you from receiving inappropriate or undesired images and videos from acquaintances and strangers. Who you add to your friend list controls who can see your content. Those who you have accepted as friends are able to view your story. Your story is made up of the snippets of life you upload to your account as pictures and videos; they are retained for 24 hours before disappearing in the Snapchat abyss. One thing to note, with geofilters especially, is that users have the option to make their content open to a wider network of viewers. This is done through a setting or channel called Our Story. Say, for example, a college campus is celebrating its homecoming weekend. That campus might purchase a couple of geofilters through Snapchat for students to use during games, tailgates, parties, etc. Users can then choose to upload that media to a sort of community story. Doing so makes that piece of media public to all other viewers within that location. Sometimes, users will find there are multiple options under the Our Story feature. Say, for example, you’re visiting Chicago during Lollapalooza and a Cubs game. The Chicago Our Story might create a differentiator so attendees know to denote which community their content is meant to be shared with. Even if a user’s personal Snapchat is not open for public viewing or friend requests from strangers, anything uploaded to Our Story is available for public consumption. Depending on the size of an event and the number of people connected to it, users could get in the millions of viewers on their content. 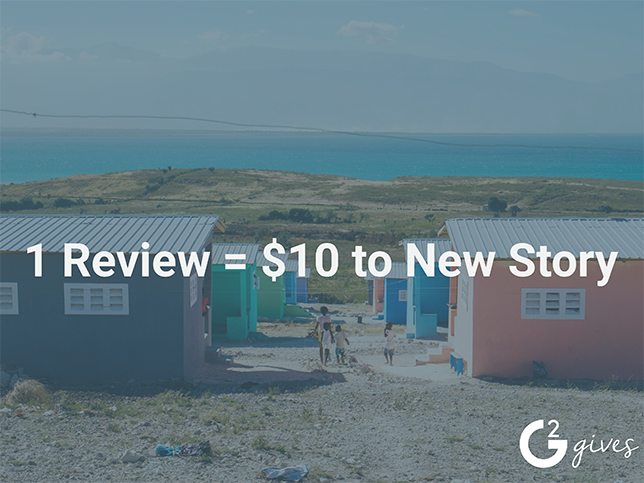 To recap: Uploading a geofiltered image or video to your own personal story will not make it public. It just gives those on your friends list the opportunity to know where you are and what you’re doing. Uploading a geofiltered image or video to Our Story opens you up to being seen by a wider network of people. Uploading something to Our Story does not always guarantee you will be added to Our Story. Content has to be vetted for appropriateness and seen if it is compelling enough to be included with other content. Typically, you’ll know if your content was approved because it will receive a much higher watched count than usual. Why do people use filters? Filters serve different purposes to different people on different platforms. For example, the filter you’d put on an Instagram picture is completely different from the types of Snapchat filters we’re discussing. For some people, filters are a way of creating a brand or aesthetic on a profile. Giving every image the same tint creates a look of consistency and effort. For others, filters are just good, harmless fun. For Snapchat users especially, they are a way to share funny images and videos with people who may live far away. When I get a video of my niece talking with the imagined voice of a bumble bee, it lights up my day a little bit. Some use filters because they’re a confidence booster. You may think this sounds absurd until you get a look at yourself with digitally elongated eyelashes. Everyone is beautiful in their own skin, but sometimes a cute selfie gives you the extra oomph you need to get through a Monday, or feel even finer during a night out. Not everyone falls in love with the app right away, and that's okay. Snapchat, like many social media platforms, has a niche audience and purpose. If you created an account only to realize it wasn't what you thought it'd be, you may be interested to know how to delete your account. Deleting the app alone does not erase your information or make it so others can't Snapchat you. In order to delete your account, you'll have to go through a series of steps. What are those steps? The question seems difficult to answer only because it can't be done through the mobile app. In order to delete Snapchat, users have to be logged in through their desktop browser. From here, users can choose to delete their account and enter a 30-day "hibernation" period until their account is completely closed out. For more information on deleting your Snapchat, as well as a step-by-step guide with visuals, read our article How to Delete Snapchat. Some have wondered if giving the masses the ability to take and edit photos reduces the integrity of the photos taken. Are we giving iPhone photographers much praise for doing little work? Rest assured, few are asking this question about Snapchat. The application may refer to its users’ works as “masterpieces,” but it feels slightly sardonic, in the way we applaud toddlers for painfully average finger paints. People aren’t on Snapchat to be the next esteemed photographer, Annie Leibovitz. (It helps that there will never be another Annie Leibovitz.) Users log on to have fun, share small tidbits of their lives, and connect with friends near and far. 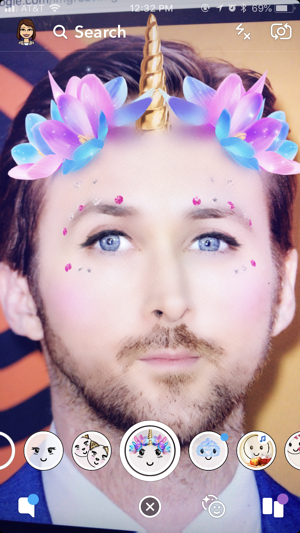 Here's one last photo of Ryan Gosling as a unicorn just because I think it's kind of funny.